This week we introduce the Bone & Biscuit in Grande Prairie, Alberta, to share their experience and local insight! Lisa Boe has been running this location for roughly 3 years now, and manages her team along with 2 dogs and cat! 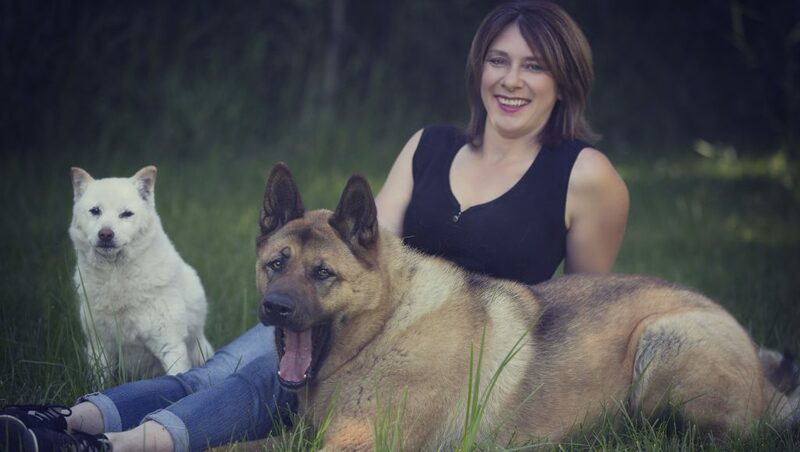 She’s very educated in pet health and is a strong believer in building the right diet for your pet! Sept 9, 2014. Opening Day was fun and exciting! We had a line up of customers waiting for the doors to open. 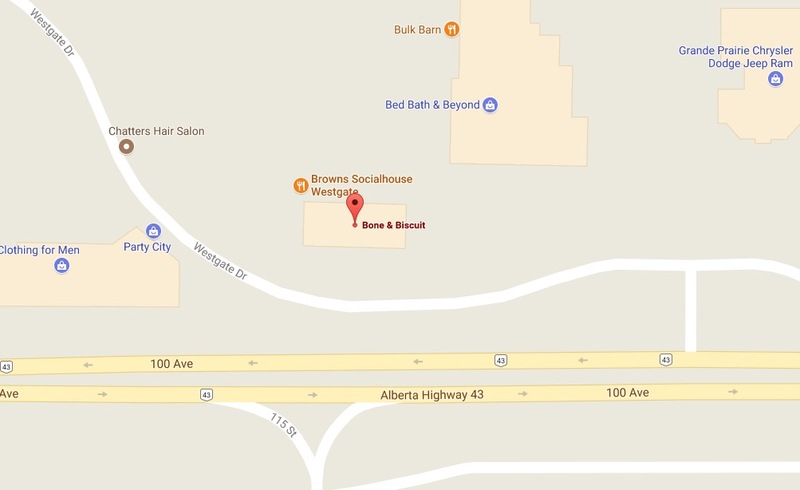 The Bone & Biscuit Grande Prairie opened in a new development at the time. We are in a shopping plaza with many stores. Bed Bath and beyond, Homesense, Pier 1 imports just to name a few of the over 20 stores to enhance your shopping experience. Our best selling dry kibble is Acana, or best selling raw is Carnivora, our best selling accessory line is Ruffwear, our best selling treat is farm fresh beef treat and we cannot keep the Balance harnesses in stock! Lisa with Jake and Ottis! Our whole team is integral to this stores success! Personally, I have 2 dogs and a cat! We have a rescue Shiba Inu named Jake. We have had Jake for 9 years he is 14 years old now. Jake is definitely getting to be an Old man. We have a rescue cat. His name is Rodney. We have had Rodney for 10 years. Rodney loves to hunt and bring us a treat a day. Could be a mouse, squirrel or bird. 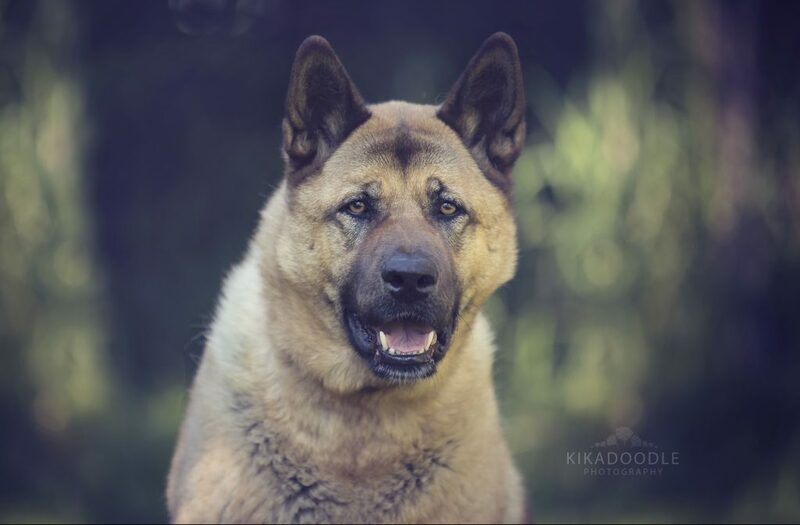 We have a Akita named Ottis and he is 4 years old. Ottis is truly a 130lb goofball. Our rescue dog has many health issues and over a period of 3 years i fed him Vet food which only made him sicker. He had so many ear infections that the vets wanted to remove the inside of his ears. I decided to do my own research. I changed to him to a grain free chicken free product Now brand. THAT CHANGED HIS LIFE! He was happy , had energy , wasn’t greasy any more. He was a totally different dog. I was at a point in my life that i was looking for something different to do and The Bone and Biscuit was a good fit for me. 9. Ottis hit the jackpot now that you run a specialty pet supply store! What kind of toy/treat does Ottis currently love? Ottis and Jake both love Raw Bones. Their favourite Raw bone in a beef meaty bone. Ottis loves all his toys one of his favourite is a Jolly Ball . He plays with it outside all the time. Jake doesn’t play a lot anymore but he loves his One 4 pet orthopedic bed. It is well used. Rodney loves honey suckle. He plays with it for hours! Good nutrition, lots of exercise and as much Love as you can will lead to happy puppy. ? 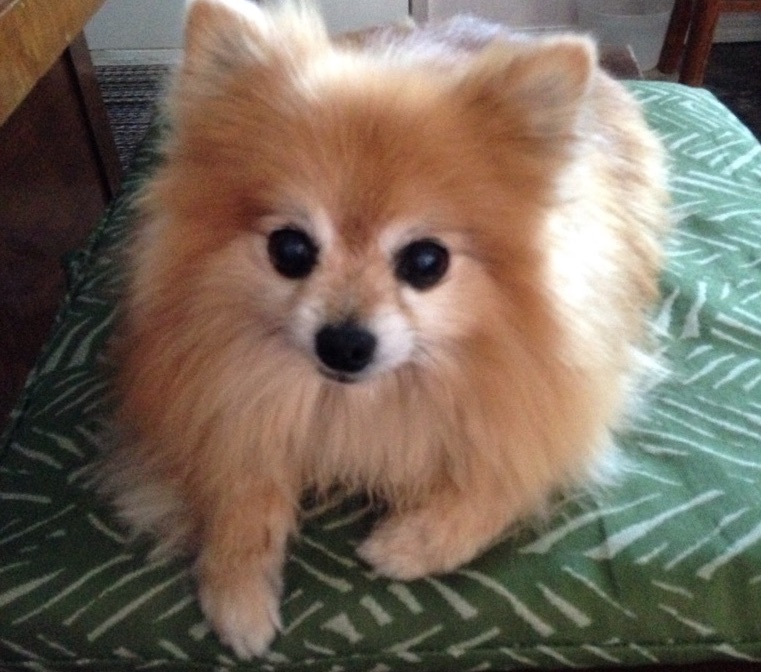 I also wanted to share a story from Connie’s Pomeranian, Juice. 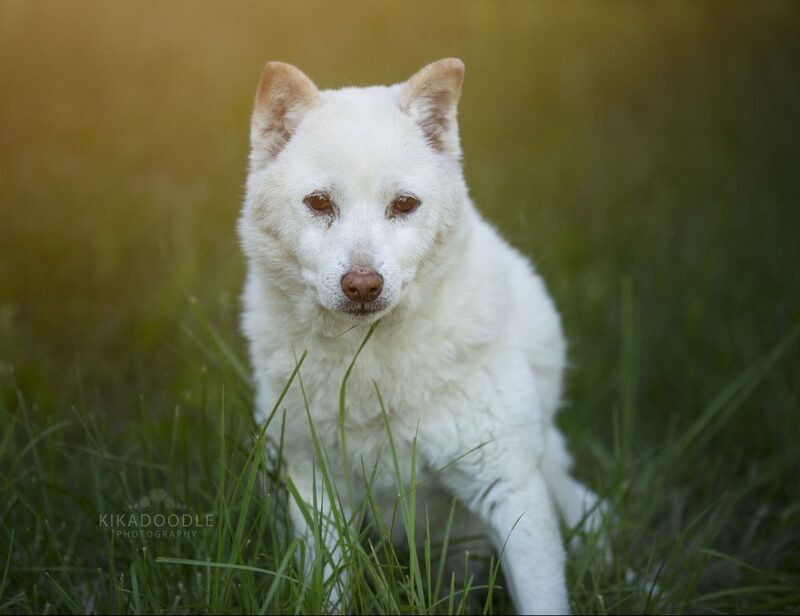 Juice is a 12 year old, female Pomeranian. When she was five or six years old she started having seizures. The vet said her liver wasn’t processing protein properly and needed to be on a vegetarian formula kibble. She also had to take two different kinds of medication. She went from having ten or twelve seizures a day to being her old self again. And then after about three years on the vet food and the medications she started having four or five seizures a day. When we started Juice on a raw food diet (Nature’s Variety Lamb Bites), we started introducing it to her very slowly because she had been on the vegetarian kibble for so long. At first we only gave her about teaspoon a day and gradually increased it until she was only eating raw food. She quit having seizures . After about eight months we started weaning her off of the medication also. She has been off of dry kibble and medication for just about 4 years now and is still seizure free. Are you interested in opening your own Bone & Biscuit pet store? See our franchise information page and inquire about opportunities in your area! ? Love this store! The staff are knowledgeable and extremely helpful and caring. Even holding the dog while I wrestle the food into the car. They fawn over any animals who visits and offer treats and photos. I love they do so much for the local rescue groups here and help out as much as they do, fantastic community leaders at this store. Will never shoo anywhere else for my pets. ❤️❤️? ?